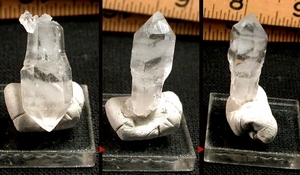 Tabular scepter crystal, doubly-terminated, outrageous rare faden veils from Arkansas will out-distance those currently flooding the market from 'alpine' areas and India. Gem clear, an uncommmon 7h face at the broad end, a 'reverse pinacoid' at the other. Record keepers, growth craters and a multi-terminated rider crystal. Minature, 1/4>5/16x 3/8>1/2x 1-1/4" tall - deserving a fine place in your collection of rarities! Montgomery County, Arkansas. No damage.